LG has its previous and current flagship smartphones on various deals across the United States. If you haven't yet purchased the G5 for less than $250, you might want to check out Verizon's promo on the much newer LG G6. For a limited time, customers can grab the LG G6 for no upfront amount as long as they agree to a new two-year contract. 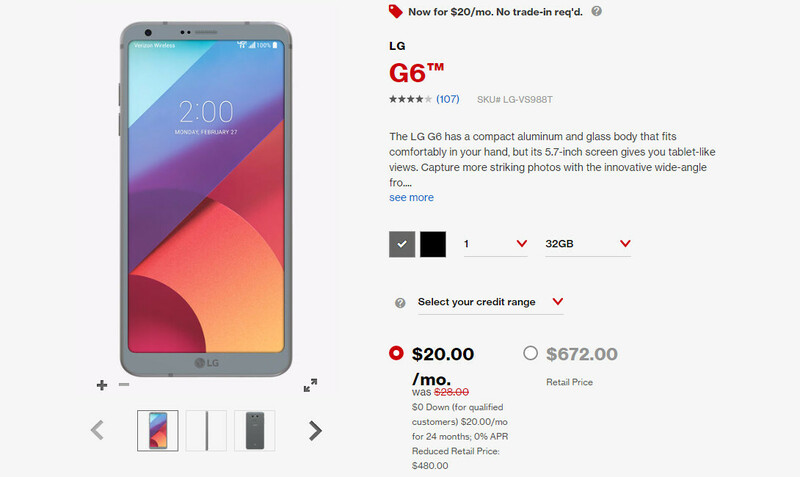 Moreover, instead of paying the usual $28 monthly fee for 24 months, Verizon now sells the LG G6 for just $20 per month. Basically, you'll be saving no less than $192 when you buy the LG G6 at Verizon and commit to a two-year agreement. The outright price of the smartphone hasn't been reduced, so you'll still have to come up with $672 upfront if you want to buy the LG G6 from Verizon. It's worth mentioning that you'll be able to choose from either black or platinum colors, and that you must pay a one-time activation fee of $30. Keep in mind that the deal is available online only, so don't bother asking in-store. Blah i guess thats ok Tmobile has had that for awhile. 20.mo or 500 upfront. Tmobile is helping lower the cost on other carriers. Competition is good for all. Unlike Socialism where there is No incentive.